In today’s world of increasing economic and industrial requirements, there is an urgent need for cleaner sources of energy. Solar energy is one fast emerging alternative choice for fossil fuels. But the high levels of energy consumption calls for the development of PV technologies that can operate on a wide range of things like electronics, clothes, wearables, and buildings. In order to make this possible, solar cells that are cost-efficient and utilize ultra-thin films that can be used for various purposes are necessary. It is also essential for these cells to be environmentally friendly in all aspects from production to usage to disposal. It is common knowledge that most of the inorganic solar cells used in buildings, solar farms and roof tops are produced using silicon. These silicon-based cells, however, have certain disadvantages such as high costs, high consumption of energy and bulky designs. A number of inexpensive thin film solar cells, alternative to silicon, comprise toxic elements like cadmium or lead, or have rare elements like tellurium or indium. Recently, a team of researchers from ICFO came up with a remedy for this urgent issue. 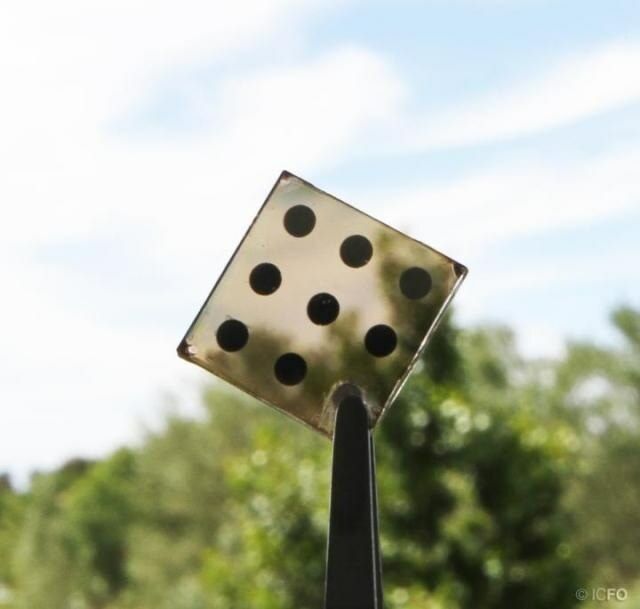 The team, headed by Gerasimos Konstantatos, who is an ICREA Professor, consist of researchers Dr. Maria Bernechea, Dr. Nicky Miller, Guillem Xercavins, David So and Dr. Alexandros Stavrinadis who have designed a semi-transparent, solution-processed solar cell based on AgBiS2 nanocrystals. These crystals form the basis of the cells, and they can be created at low temperatures in ambient surroundings and contain non-toxic, clean elements that are easily available in large quantities in earth. The nanocrystals are naturally capable at panchromatic light absorption. The team has further tweaked the crystals to function as efficient charge-transporting mediums to be used in the solution-processed solar cells. They contain AgBiS2 nanocrystals, a novel material based on non-toxic elements. The chemical synthesis of the nanocrystals allows exquisite control of their properties through engineering at the nanoscale and enables their dissolution in colloidal solutions. The material is synthesized at very low temperatures (100ºC), an order of magnitude lower than the ones required for silicon based solar cells. The ICFO research team designed the cells using a low temperature hot-injection synthetic process. The first step of the process involves the immersion of the crystals in organic solvents. These solutions did not have any negative impact on the performance of the device and remained in a stable condition for months. The crystals were then placed on a thin film of ITO and ZnO, the most frequently used transparent conductive oxide, through a layer-by-layer deposition method in order to obtain an approximate thickness of 35 nm. "A very interesting feature of AgBiS2 solar cells is that they can be made in air at low temperatures using low-cost solution processing techniques without the need for the sophisticated and expensive equipment required to fabricate many other solar cells. These features give AgBiS2 solar cells significant potential as a low-cost alternative to traditional solar cells." explains Dr. Nicky Miller. According to the initial report, the solution-processed cells have been able to reach the same efficiency of the latest high performance thin film PV technologies. The solar cells fabricated by the researchers are capable of achieving an efficiency rate of 6.3% in power conversion. This proves that AgBiS2 is capable of becoming a strong competition to other thin film technologies that are produced through high-temperature, vacuum-based procedures, in the next few years. This is the first efficient inorganic nanocrystal solid-state solar cell material that simultaneously meets demands for non-toxicity, abundance and low-temperature solution processing. These first results are very encouraging, yet this is still the beginning and we are currently working on our next milestone towards efficiencies > 12%. The study is notable for the changes it can create in areas such as the design and production of solar cells. While being a cost-efficient alternative to silicon-based cells, the solar cells designed by the ICFO research team also offers an environmentally friendly solution that paves way for a cleaner, more sustainable and safer future for planet earth. The research, which marks a significant break-through in the solar cell field, has been sponsored by European Commission under the NANOMATCELL project.